Here's a big announcement from AMD's 2017 Financial Analyst Day: Ryzen is finally coming to laptops and notebooks. AMD senior VP Jim Anderson pulled the cat out of the bag. The Ryzen Mobile CPUs won't just bring a lower-TDP Zen architecture—the CPUs will pack on-die Vega graphics cores, too. 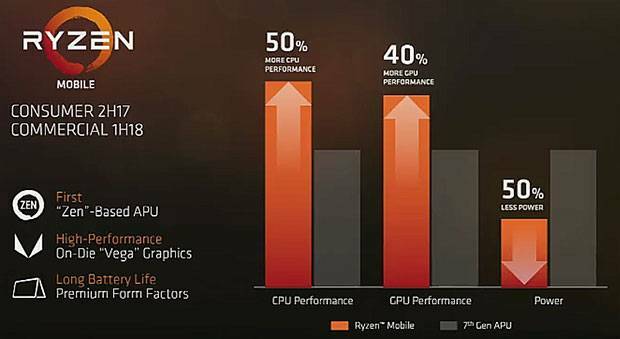 AMD is promising that Ryzen Mobile should offer 50% better CPU performance and 40% better GPU performance than its A-series APUs. Perhaps more importantly than either of those measurements is the promised 50% drop in power requirements versus those APUs. The company says that consumers can expect machines with Ryzen Mobile inside during the second half of this year. Commercial deployments are expected to being in the first half of 2018. AMD equally expects that Ryzen Mobile will go into "premium form factors," which we take to mean ultrabooks. Given that AMD hasn't really been a contender in the mobile space for a while, this is all welcome news.